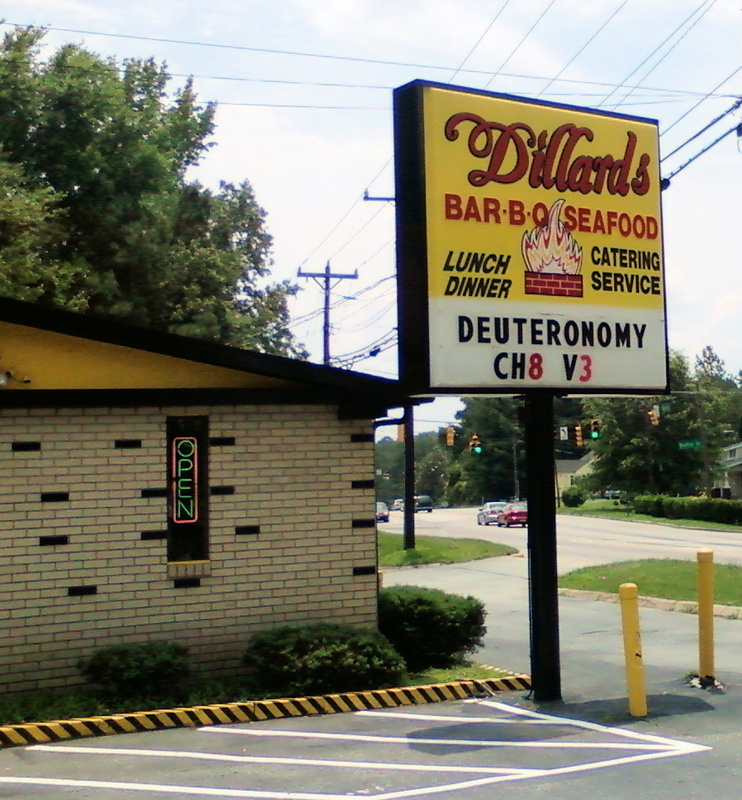 Dillard’s offers a large buffet of “southern style soul food,” as the restaurant’s website puts it. (I have yet to experience northern style soul food, and hope to maintain this spotless record but I digress… .) The buffet is served cafeteria style by friendly staff, some of them direct descendants of Sam Dillard, who happily offer descriptions of the items of the buffet and even samples for those who can’t decide. Menu options include chopped barbecue, ribs, chicken, fish (catfish, croaker, trout, shrimp) and soul food specialties like pig’s feet, chitterlings, meat loaf, and beef livers, among other main courses. 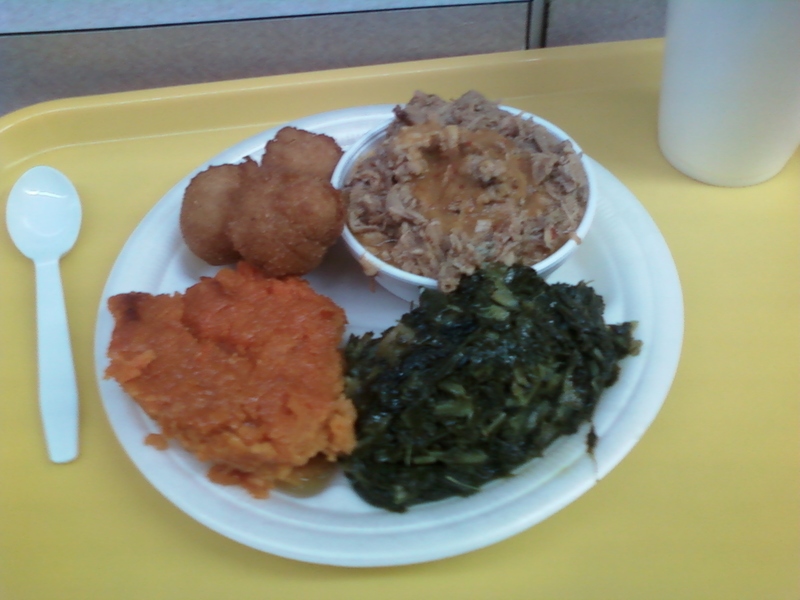 Sides include black eyed peas, yams, okra, carrott souffle, mac ‘n’ cheese, greens, hush puppies, slaw and much more. See the full menu online, but note that offerings vary day to day. I have a real soft spot in my heart for Dillard’s (and I don’t just mean my arteries), as I have been dining there from time to time for a decade or more. I continue to enjoy my meals at Dillard’s but less and less for the barbecue. Although the South Carolina-inspired, mustard-heavy vinegared barbecue sauce is as flavorful as ever, the barbecue itself has really gone downhill. For the last few years the ‘cue has been limp, soggy nearly flavorless pork–the kind of pork that needs to be drowned in sauce to make it palatable. Since I judge BBQ joints primarily by their ‘cue, I can’t in good conscience give Dillard’s any higher than a C rating. Even the C is earned more because of the sides, which range in quality but include some good renditions of southern staples. In short, I’d recommend visiting Dillard’s for the history, for the warm atmosphere, for the bounty of side dishes, and for items like pig’s feet if you want to sample them, but not for the barbecue. That said, I can dream that one of Sam Dillard’s descendants will decide to rebuild a wood pit and hire a pitmaster who can bring the pork up to the standards of the Dillard’s name. To paraphrase Crash Davis from the movie Bull Durham, I believe in the soul, the small of a woman’s back, that Lee Harvey Oswald acted alone, and that most roads are plenty wide already. I believe there ought to be a constitutional amendment outlawing Astroturf, the designated hitter and so-called barbecue joints that cook with gas/electricity. And I believe that too-wide roads running through formerly-great-but-now-entirely-ordinary barbecue joints that long ago stopped cooking over wood coals are just plain sad. I agree Porky, Dillard’s Q is average at best. I gave it a 2.5 on my 1.0 (worst) to 5.0 (best) scale. I found the Q too moist, but extremely tender. Some of their sides are wonderful!